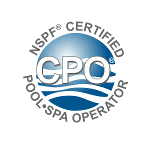 ​"I wanted to thank you for doing such a great job with my pool. I’ve been really happy with how great it looks and I owe that to you. ​The kids will be enjoying it this weekend. Thanks again." ​not have to worry about it anymore!" "You are doing a wonderful job on my pool. Thank you for all of your help with my pool. I hear of anyone in need of a pool service." How will I know if you are taking care of the pool as we agreed? After every visit I leave behind a written receipt. The receipt allows you to see what day I visited, if you need to add water, if I need you to call me, or room for notes if there is something else that you should know. This receipt let's you know I serviced your pool. What do you charge for weekly pool service? The work load and location of each pool can vary greatly. I can give you a free estimate for pool service after I see the pool. There's no need to meet in person at this point if your'e too busy. What will you do on each visit? What charges are not included in the routine monthly service? My wife and I are residents of Petaluma. The majority of my work is based here though I do go up to Rohnert Park. My customers can quit at any time. I don't believe in having my customers "locked in" to service contracts. 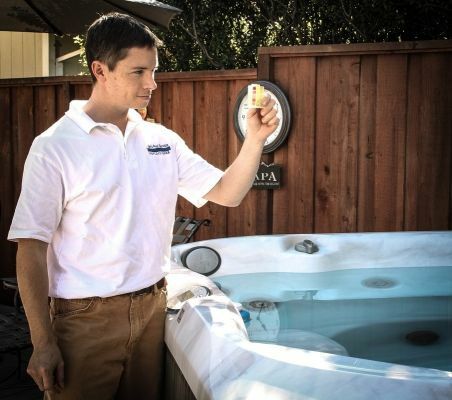 Do you service spas/hot tubs? I am happy to say that I do offer weekly service for spas. Spas need to be drained and refilled every 4-6 months. I service spas every week. If the spa is part of the swimming pool there isn't an additional cost for service. There is hope! Call me to clean up your pool. Can you do a spring clean up for pools ? To clean up a scummy pool I charge an hourly rate plus chemicals and equipment parts if needed. Call for a free estimate. Do you send a monthly invoice? invoice you'll see total of overdue invoices plus the current invoice. Payments are required within 25 days. How will I know if repairs are needed? replace equipment to keep your pool clean and sanitary. Can you get rid of swimming bugs in my pool? Yes! But you can too! Click below to read how. Just filtration, cleaning and sanitation are not enough — balancing pH (potential hydrogen) and alkalinity is vital. Chlorination should keep germs and algae at bay but when pH and alkalinity is unbalanced, the chlorine can’t do its job because it becomes less effective at its primary task — killing bacteria and algae. I can repair any pool equipment above ground. That includes heaters, salt systems, filters, valves, above grown plumbing, pumps, solar panels, solar panel controllers, automation control panels, and mechanical timeclocks. Fill out the contact form if you'd like an estimate for repair. Skimmers, underground plumbing, concrete decks, tile, and plaster are all items I can not repair. Water balance is composed of several key factors — pH, total alkalinity, calcium hardness and TDS. All of these factors are important, but none more so than pH. Can you take care of salt cell chlorinators? Periodically your cell will need to be soaked in a mild acid solution and sprayed out. This will remove the build up inside the cell. You will know when the cell cleaning was performed because it will be written on the service receipt. There is not an additional charge for this routine cleaning. If you're interested in upgrading to a saltwater pool system click on the button below. ​What else can unbalanced water do to my pool? If you let the pH or alkalinity drop too low then the water becomes acidic the water dissolves plaster and metal parts in the pool equipment. When pH or alkalinity drifts up, the water becomes alkaline and creates an environment where mineral deposits (scale) can form making the plaster ruff and abrasive while the heater and filter plugs up with calcium! Weekly testing and chemistry adjustments that I perform avoids large repair expenses to the pool owner. Do you clean the filter? 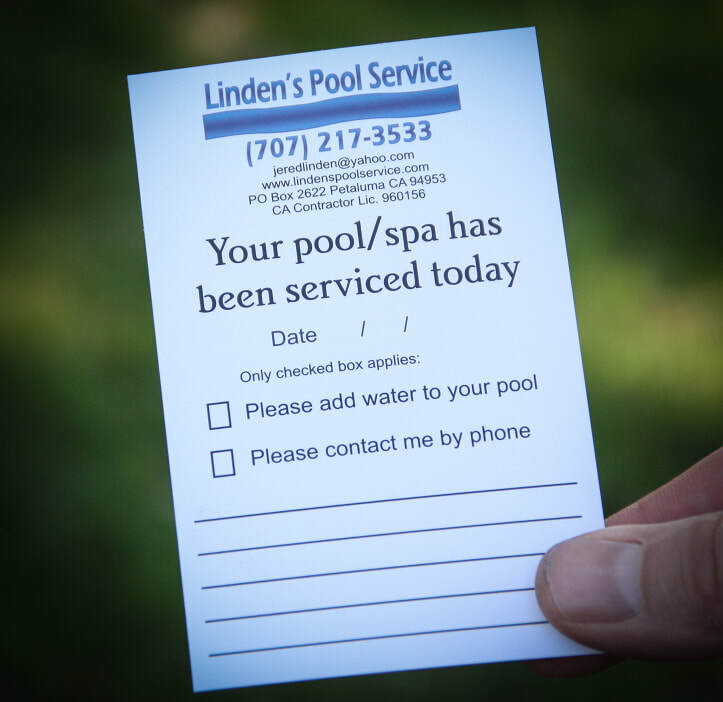 Filter cleanings are required on an annual basis to keep the pool clean and healthy and it takes about 1 hour. Unfortunately this is not optional and is a very necessary expense to keep the pool from becoming green. Every year I send my customers a notice that I will be cleaning the filter in the coming months. This is usually in the Spring. The filter cleaning charge will then be on that month's invoice. Are there ways to save money on electricity?